Need an Indiana Dealer License? Here's How to Get Yours! 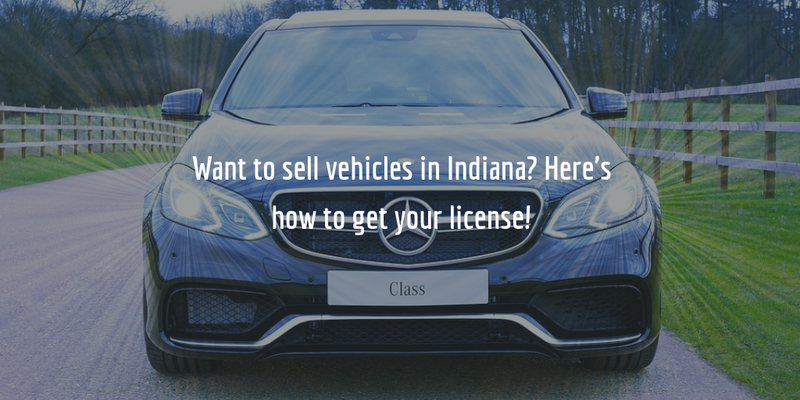 If you’re selling or advertising for sale 12 or more vehicles per year in the state of Indiana, state law requires you to obtain an Indiana dealer license. To obtain your license you will need to secure a business location that complies with state requirements, fill in an application, and post an Indiana auto dealer bond, among others. Read on for an overview of the process and the license requirements. For any of these vehicle, license holders can also indicate the state of the vehicles they intend to sell, offer or advertise – new only, used only or new and used. Read on below for a breakdown of the Indiana dealer license requirements. Applicants for an Indiana dealer license are encouraged to review the relevant state statutes and regulations prior to getting started with their application. These are the ‘Indiana Code (IC) 9-32 Dealer Services‘ as well as the Indiana Administrative Code (IAC) Title 75. Once you have familiarized with the statutes, you can proceed with filling in the Indiana dealer license application (SF 13215). When completing the application, you will need to meet the requirements for your place of business, and provide proof thereof. You can find the requirements in the IC 9-13-2, IC 9-32, and 75 IAC 6 or on the licensing requirements page of the Indiana Auto Dealer Services Division. Upon applying for your license you will also be required to pay an application fee for an initial license in the amount of $30. If you are uncertain about any of the requirements, make sure to contact the Dealer Services Division to clarify them and seek further advice! The auto dealer bond is a central licensing requirement for Indiana dealers. This bond serves as protection to the state of Indiana and the dealer’s customers. It guarantees compensation to these parties if a legitimate claim is filed against the dealer’s bond in response to his or her violation of Indiana state statutes and regulations. To obtain the bond, dealers must pay a surety bond rate which is not the same as the $25,000 bond amount. The cost of the bond is determined by sureties on an individual basis for each applicant. It is based on a consideration of the financial status of the applicant, with the most important criteria being their personal credit score. Other indicators such as their financial status, liquidity, assets and prior work experience also impact the final cost of obtaining the bond. As a rule, applicants with a good score can expect a rate between 1% and 3% of the total bond amount or, in this case, between $250 and $750. To get your Indiana auto dealer bond, fill in our online surety bond application form. Completing and submitting the application is not binding in any way. Once you have submitted it, we will contact you with a free quote on your bond and you can then proceed with finalizing your application. Call us at 866.450.3412 to speak to one of our experts anytime, if you have any questions regarding the bonding process!